Located in one of Málaga’s residential areas, just 300 metres from the seaside promenade which runs alongside to the city, La Francesa Suites Boutique Bed & Breakfast is a beautiful Andalousian villa that was built in 1911. 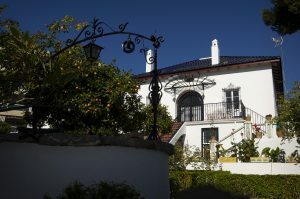 Formerly the private residence of the British consul in the bourgeoisie, commercial and cosmopolitan city of Málaga at the turn of the 20th century, the house was built by his wife, of French origin, in accordance with the purest of Andalusian style of the time, crowned with a French style garden full of orange and lemon trees. Every spring, more than eighty different varieties of roses bloom amidst the gentle backdrop of the water fountains. Since the house was originally built, it has come to be known locally as “la casa de la francesa” (the French lady’s house), which is the origin of its current name (La Francesa Suites). In this new hotel concept our guests will enjoy our personal attention, the exclusive enjoyment of our facilities, and a wide range of services and information such as guided city tours, wine routes, sport and nature activities, visits to concerts, the theatre, to name but a few possibilities.